Your price: $25.00 83% OFF Retail! Hi there,If you like the thrill and profit potential of reversal trading, this might be the most exciting letter you’ll read this year. We’ve successfully combined one of the most time-tested trading strategies of all time AND our unique trading insight & algorithm to create an amazing, new indicator called “Divergence Solution”. Divergence Solution is probably the best reversal indicator ever developed. First, the Divergence Solution indicator detects all possible reversal trade setups based on divergence. 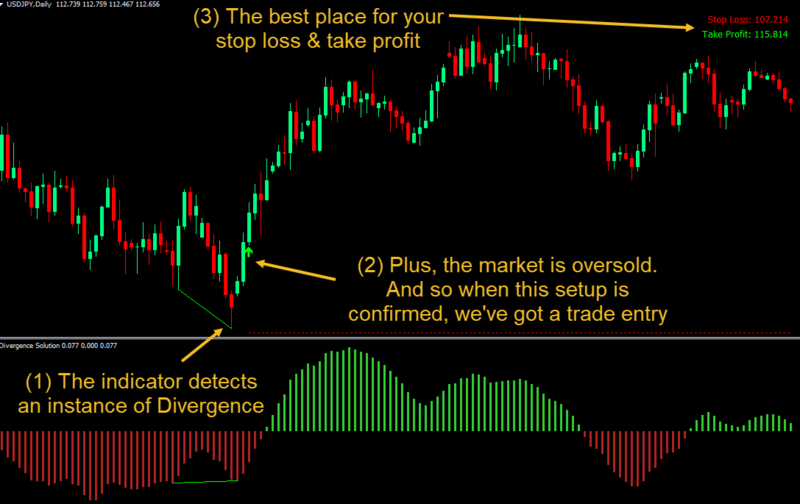 And in case you didn’t know, divergence is one of the most time-tested & proven strategy for trading reversals. The best part is — divergence is UNIVERSAL. It works in MANY markets across ALL timeframes. 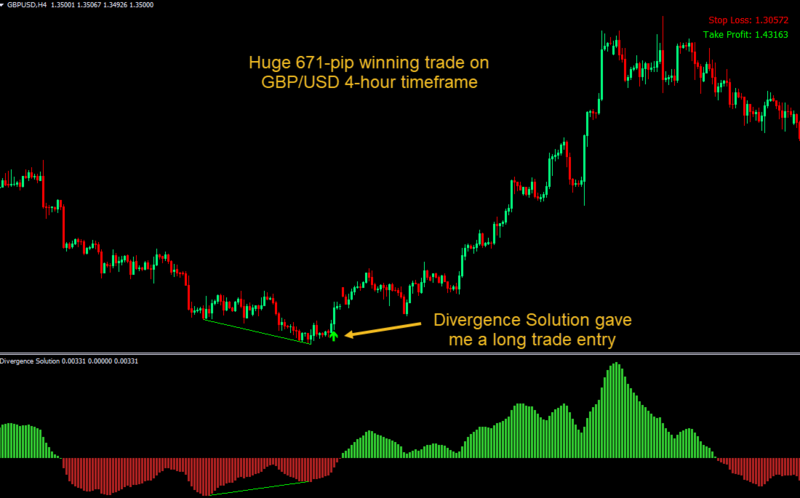 In other words, many professionals consider divergence as THE standard method for trading reversals. 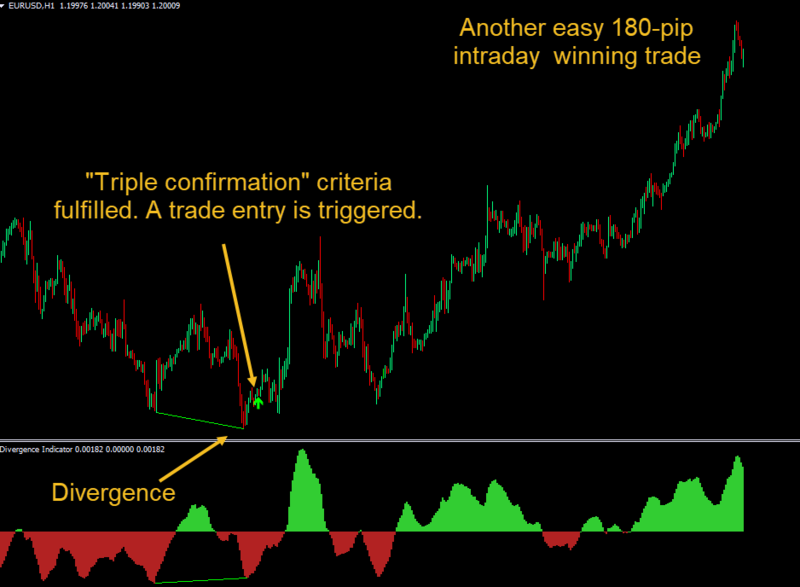 Once all possible trade setups have been found, the Divergence Solution indicator uses our patent-pending TRIPLE CONFIRMATION algorithm to rank these trade setups by WINNING PROBABILITY. And then the indicator eliminates most (if not all) false signals and shows you ONLY the very best trade entries that have the highest probability of winning. There’s a reason we aptly named this indicator “Divergence Solution”. 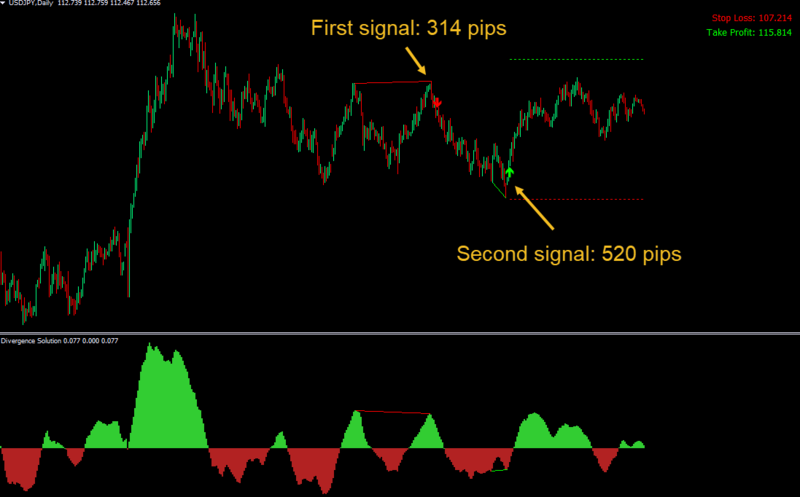 In this example, the Divergence Solution indicator detected 2 signals in a row: The first signal results in an easy 314-pip winning trade. 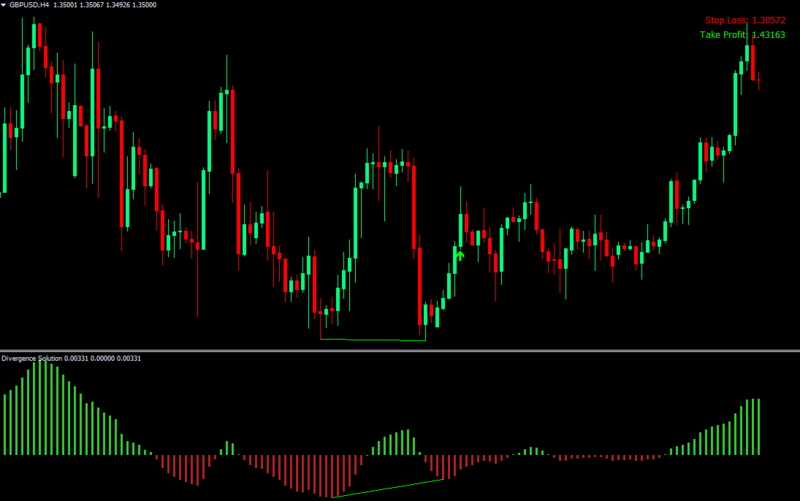 And the second signal gives us 520 pips in profit at the moment. This trade is still on-going. And I think we’ll probably hit our profit target pretty soon, banking even more profit. First, when the market is overbought, the indicator is looking for any instance of bullish divergence. And once a bullish divergence is found, the indicator is waiting for a confirmation using our patent-pending TRIPLE CONFIRMATION algorithm. And when all these stringent criteria for confirmation are fulfilled, the Divergence Solution will issue a buy alert. This way, we make sure that we eliminate most of the downside of trading reversals (which is false signals) while retaining ALL the upside of trading reversals (which is its gigantic profit potential). The default settings for our stop loss and take profit ALWAYS ensure that the Reward:Risk ratio of EVERY trade is 3:1. Which means, when you lose, you’ll lose only a little. But when you win, you’ll win BIG. And that also means you only need to win 34% of the time in order to make a profit! This time, we’ll anayze a day-trading timeframe: 1-hour timeframe. In this example, shortly an instance of divergence occurs, our Triple Confirmation criteria are fulfilled. And we’ve got a buy signal. The market quickly goes up in our favor. And right now, we’re up 180 pips already. And here’s a quick tip for you: I would exit half of my position right now, and move my stop loss to break-even for the remaining half. This way, we have the best of both worlds: We make sure that we’ve got some profits in our pockets as soon as possible. And we also make sure that we can maximize our profits if this uptrend continues WITHOUT any risk by moving our stop loss to break-even. 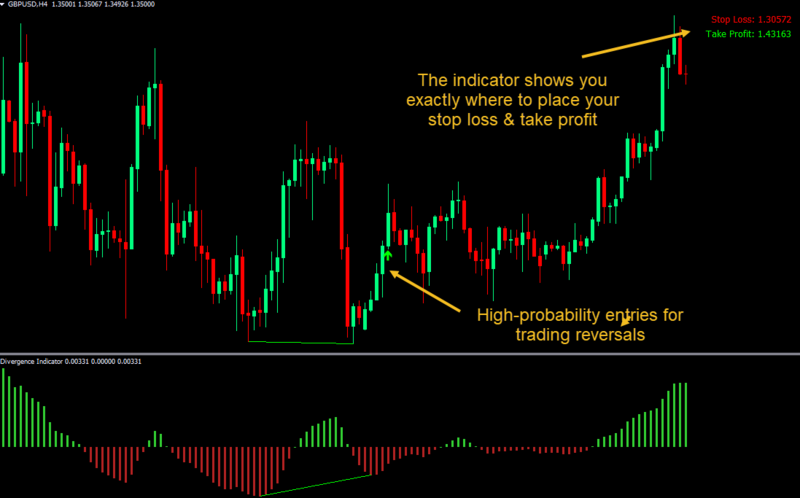 The Divergece Solution indicator works equally well for scalpers, day traders, and swing traders. The Divergence Solution indicator filters out most (if not all) false signals, so you’ll get the VERY BEST trade setups. Plus… you’re in total control. For example, you can change the color of any text, entry, stop loss & take profit. And… you can even set how strict you want the indicator to be. For example, if you’d like to be really strict and want to identify only the highest-probability trade setups, you could easily do so. On the other hand, if you want to get more trade setups, it’s also 100% possible. 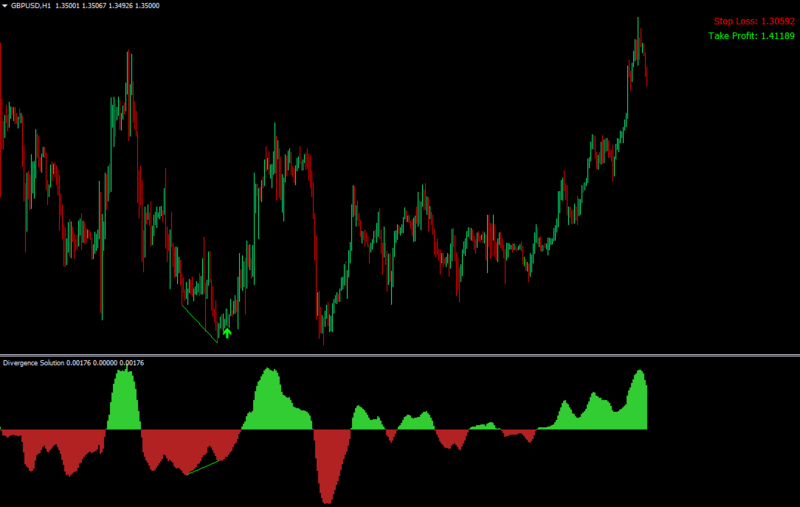 In addition, the indicator is extremely flexible: Works on ANY currency pair… ANY time-frame. It also works on indices, stocks, commodities, and futures. Virtually any instrument you could think of. Further down this page, you’ll notice there are TWO purchase options you can choose. You can get Divergence Solution indicator alone for an insanely generous price I’m giving the first 200. Or… you can invest a little more and get the Indicator Vault’s All Apps package. So What’s Inside The “All Apps” Package? First off, you get the Divergence Solution indicator. And on top of that, you’ll also get access to the ENTIRE collection of 30+ top-rated custom indicators. Including Trend Focus, Swing Force, Scientific Scalper, Better Trend Trading, Logic Day Trading, Candle Meter, Precision Strength Meter, Drag & Drop Volume Profile and more. 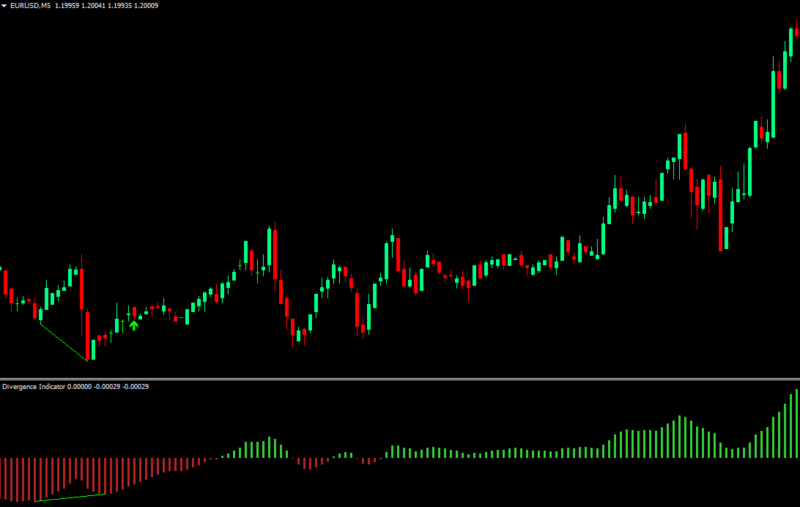 You’ll get the Divergence Solution indicator (Includes ALL features, Works perfectly on Metatrader4). UNLIMITED license: Use the indicator on as many computers and accounts as you wish. You’ll also get access to the ENTIRE collection of 30+ top-rated custom indicators. UNLIMITED license: Use the indicators on as many computers and accounts as you wish.